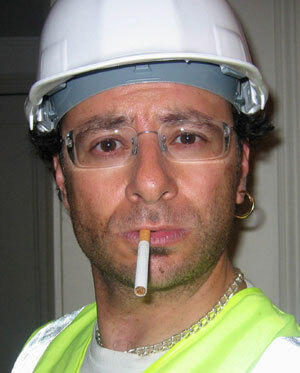 Trevor Feet has 23 years experience in the building trade and has been into yoga for "quite some time now". He got into it to help him “calm down after work”. Trevor is an expert in sanding, partitioning and yogic chanting and is now head of London's only Plasterers and Decorator's yoga society. He is the only bloke down his pub who "knows what a lotus pose is" and has taught well over 4 yoga workshops nationwide since 1995.